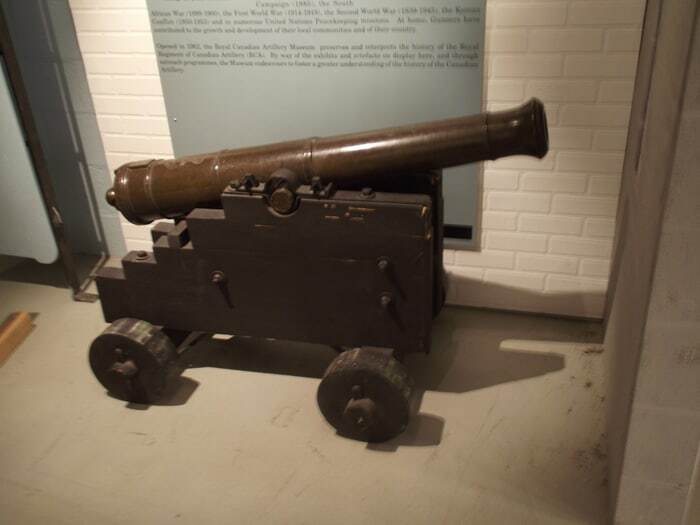 The brass 3 Pounder Smooth Bore (3 Pdr SB) gun was used notably by the Hudson’s Bay Company. The gun is mounted on garrison carriage used in fortifications. Gunners called the 3 Pdr SB guns “grasshoppers”. The cypher on the barrel closest to the muzzle is that of the Master General of Ordnance 1807-1810, the Earl of Chatham. The cypher closest to the opposite end is that of King George III (1760-1820). Canadian Guns are inscribed with the cypher of the reigning Monarch to this day. This particular gun is on loan from the Lower Fort Garry National Historic Site.